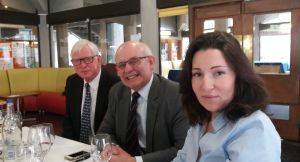 Invited by Sir David Madden, former British diplomat and Chairman of the SEESOX Steering Committee at St. Antony’s College in Oxford, Nataša Marić Charge d'Affaires in the Embassy of Serbia in London participated in the 6th SEE Ambassadors’ Forum, held on 3 May 2018. The Ambassadors’ Forum included two thematic sections: the situation in the region with the emphasis on the upcoming summits - the EU-WB Sofia Summit and the WB Summit in London, and the role and significance of the diaspora of SEE countries in the UK. Charge d'Affaires Nataša Marić presented our views on cooperation in the framework of the Berlin Process, while on the second panel she presented the engagement of the Embassy in London to strengthen cooperation with the organizations of the Serbian diaspora in the UK and the importance of institutionalized cooperation between the Republic of Serbia and the organizations of the diaspora abroad.